Inaccurate Driver - How can I get consistent swing results? Why do I periodically get a 350+ drive? How can I get OptiShot to fill my entire screen? What is the best computer for OptiShot? How do I eliminate inaccurate swing results? Why won't the software run properly? OptiShot freezes when I create a player. How do I fix this? How do I update video drivers? How do I update OptiShot? OptiShot is designed to automatically update itself when new releases are available. These may be for the OptiShot program itself, updates for existing courses or for new courses being made available to our users. 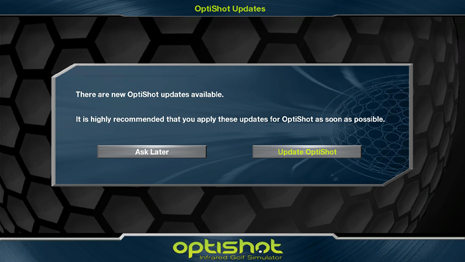 During the start up process, if updates are available, you will be presented with a window offering you the choice to Update OptiShot or Ask Later. If you choose Ask Later, OptiShot will open, the next time you run it you will again be prompted to update. Note: This update process requires an internet connection. If you do not have an internet connection you will not be prompted. To receive the updates, you can either connect the machine to the Internet just for the update, or purchase a replacement disk. To purchase a replacement disk visit our Online Store. Should you choose to Update OptiShot, OptiShot will close down and our Updater window will appear. This will list exactly what is being downloaded and show you the progress. 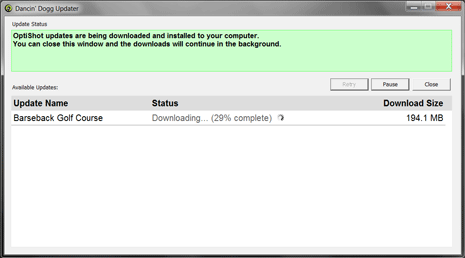 It is best to allow the updater to complete its downloads before starting OptiShot again. Once all downloads have completed you may restart OptiShot. Should any Updates fail you may opt to click the Retry button and OptiShot will try again to download the updates. If you do not click Retry, then the next time you start OptiShot you will be prompted to download those Updates that did not succeed. How do I register OptiShot and what does that mean?